For many couples the wedding reception and celebration on their wedding day is highly anticipated. It is a time to gather your friends and family together and share one of your happiest moments. Celebrate your incredible wedding day with those who mean the most to you with an evening of exquisite dining and fine wines. Whether your dream wedding is a grand ballroom affair or a romantic intimate setting, we offer a variety of unique banquet rooms that seat up to 320 guests to accommodate your one of a kind wedding reception. 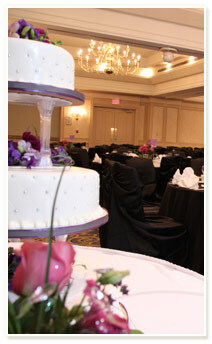 The elegantly appointed ballrooms offer the perfect setting for grand affairs. A regal colour palette and high ceilings accented with exquisite chandeliers provide a memorable backdrop for your wedding day. Large floor to ceiling windows highlight the spectacular views of the outdoors as your guests celebrate with you and dance the night away. Maximum capacities are subject to change should extensive setup be required in the room. 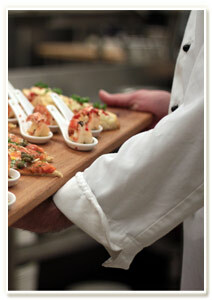 ^A minimum of 190 adults may be accommodated, based on available and is subject to a surcharge - inquire for details. Our private banquet rooms offer a refreshing bright space to host your elegant wedding reception. Wood accents are carried throughout the room and complimented with a neutral colour palette and delicate textures. Natural light fills the rooms bringing the beautiful natural elements indoors and offering an intimate space to celebrate your wedding day. These private wedding reception rooms offer a unique space to host your exceptional wedding. Suiting a variety of décor styles, our banquet rooms offer a charming rustic feel accomplished through a palette of earth tones and natural textures. Our Fiesta Room features a stunning granite fieldstone fireplace which adds a romantic ambient glow throughout the room for your wedding day. Maximum capacities are subject to change should extensive setup be required in the room. Our dedicated culinary team provides innovative and delicious menu options featuring locally grown and in-season foods for your wedding reception. When planning your wedding with us, we invite you to join us for a trial wedding dinner. Proud of the culinary talents of our chefs, you will be served full plate portions, allowing you to sample a variety of wedding menu options and experience the outstanding food presentation available as part of your wedding package. Our banquet chef will meet with you personally to discuss your wedding menu choices ensuring that your wedding reception is exactly what you envision.